Ok, does it make any difference where the RFI suppression come from and where it's located on the ignition wires ? Can it be a resistor plug cap or a resistor plug or resistor wires? The very best plug wires from a conductance perspective are multi-strand copper wires. From a RFI perspective, solid core wires will act as broadcast antenna transmitting the ringing voltages to other wires. The insulating propertiy of plug wires is quite important, possibly equally important to low resistance wires. But where does the RFI originate? We have used copper mesh shielded wires, grounded wires, and all sorts of "trick" wires. The RFI comes from ringing voltages created when the firing voltage drops at an air gap. Where are the air gaps? At each spark plug and at the distributor cap rotor/post gap. High resistance connectors at each end of the plug wire will dampen the ringing. Ringing can be determined by holding a scope probe at various points along the secondary wire path. Or, bag the whole problem and go to a coil over plug system. My bikes, like almost all bikes, are a coil near plug like an LS Chevy..If I understand this, the wires themselves transmit the ringing or RFI ,so do the carbon core or spiral wound wires prevent that? Then something is still needed near the air gap at the plug like a resistor terminal pr spark plug? Far as I know, the RFI is a result of amperage in the conductor creating an electromagnet, with the length of the conductor acting as a broadcast antenna. A resistor that reduces the amperage also reduces the electromagnetic effect. A resistor ANYWHERE in the circuit will drop the amperage. 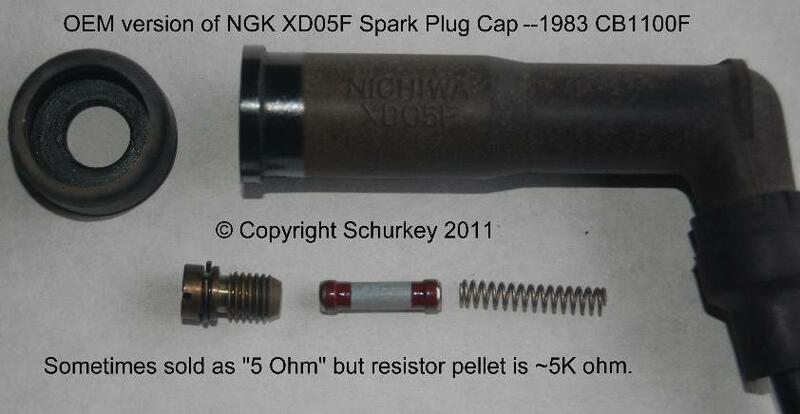 So, yes, a resistor "pellet" in the spark-plug cap that the Japanese are so fond of, or resistor plugs, or resistor wires, or any other method or placement of resistance in the secondary circuit will be effective. The only thing that matters is whether there's "enough" resistance. Another way to solve the same problem is to use shielded wires, or a shield over the wires, that "encloses" the RFI. This is typically more-expensive, and harder to incorporate into the vehicle design. A third way is to create a "choke" for the current (amperage) of the secondary circuit to flow through. It reduces the current flow via inductance instead of resistance. Thus is born the "helical"- or "spiral"-core plug wires. Make no mistake--they're still killing the amperage, but they're doing it in a way that doesn't show up on an ohmmeter. Then I got a Mallory multi spark box, used it with the points and went back to the spiral wires and there was no stumble.. So it appeared the points ignition didn't have enough energy to fire a lean mixture with any suppression in the system...I believe the wires shortened the spark duration more than the actual voltage? Anyone ever wonder what company makes the actual plug wires? These wires are then advertised as god's gift to racers by race companies in different colors. I think I have used every brand and color with the appropriate BS thrown at us over the years. This includes cheap, over priced and sponsor supplied sets. I can't say that I ever ran one that did not work out of the box. I did cycle them out as is the norm from use or maintenance checks. Since there is no HP gain from one brand or color to the next I quit worrying over this long ago. Back when we only had solid core wires I think I changed them more often but they were easy to tell when they were failing. Standard produces a lot of parts for a lot of people. Most of the parts stores' get their stuff from Standard. They produce BWD, TechSmart, 4 Seasons, and a bunch of other stuff, AFAIK. They also produce a bunch of white-label stuff for them, also, IIRC. I have bought these Scott Plug Wires. Quality construction in any color you want (I got the basic grey). Engine is almost done. Waiting on head gaskets on order. They are in Mooresville, NC NASCAR country so must be good! It wouldn't surprise me to find that these and the Firecore 50s are made by the same place. I'd expect something like that. Anybody know where Scotts components are made at before they assemble them into custom wire sets? Scott wires are the best wires I've ever used. In most cases, just one 5kΩ suppressor in the HT line is sufficient. Most often that comes as a resistor spark plug. More resistors, such as resistive carbon suppressor wires, in the line only cause the spark to be weaker. In all our applications with electronic ignition, a resistor plug works great. In our points/condenser applications we use all copper wire and a non-resistor plug. Maybe if your ignition/computer is ultra sensitive to EMI, then look further. I'm running a MegaSquirt ECU with solid core wires and resistor plugs. When I turn on the AM-radio in the car with the engine running, the speaker sounds like a Geiger counter in close range of a radioactive source. But with the built-in noise filters I was able to filter out any noise or 'fake' trigger-signals on the MS. In some cases of common chassis ground, it could be beneficial to install a radio suppression capacitor on the ignition, if it doesn't pose any issue with the other electronics. 1 to 3 microfarad at 50v should do, or just ask for a radio suppression capacitor at your local auto supply. Taylor solid copper and no resisters for the way old style point distributor I am going to use. You would be better off using the spiral wound wires as they last longer and are the same as the solid core wires for 0 resistance and no voltage leaks after a couple years of use. I have seen those wires cause no start issues when its a damp day and above normal humidity causing the wires to short out to the engine and cause hard starting issues. Turn the lights off at night and see what is going on..